MPE Machine Tool Laser Calibration Services can help to reduce scrap, improve machine accuracy and keep your machine tool in spec. Our trained technicians use Hamar Laser equipment and will measure and correct Level, Alignment and Roll-Pitch-Yaw errors in your machine. Our Renishaw Laser Interferometer System is used to provide compensation for linear machine axis travel. 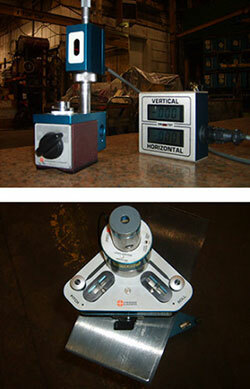 Coordinated axis position may also be recorded and adjusted using our Renishaw Ball Bar System. Included in your documentation package, MPE will record before and after stats, along with traceable calibration documents on the laser equipment.